1. Make sure it is legal. Some jurisdictions may not allow pet ownership of a hedgehog or may have restrictions for specific reasons. Find this out first before setting your heart on a hedgehog. 2. Be hedgehog savvy. Read up on your future companion before looking for one. This will help you to identify the type of hedgehog you are looking for, as well as helping you with the questions that you need to ask (see next step). In addition, it will confirm in your mind if a hedgehog is the right pet for you. 3. Never, never, NEVER buy a hedgehog from a pet store, or from sites like Craigslist - you do not want a baby from a backyard breeder! They are almost guaranteed to have a poor temperament and die young due to their poor genetics. Don't support animal dealing or backyard breeding! Do they have quality parents? Be sure that they have pedigreed animals that are clear of WHS (wobbly hedgehog syndrome) and cancer. Ask to see the animals' pedigrees, and if you feel like being extra careful, confirm with those other breeders that the pedigree goes to that animal. Do not purchase a hedgehog from a backyard breeder who breeds unpedigreed animals! Do they use good breeding ethics? Ask them if they practice inbreeding, how often females are bred, and how soon the babies go home. Babies are weaned at 6 weeks but should not leave the breeder until at least 7 weeks of age. Be sure they properly socialize their hoglets. Ask them how early they start socialization, how often they socialize, and for how long. Ask them what handling methods they use and what the babies will be exposed to. Are they licensed? 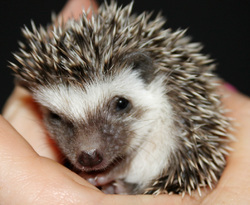 Breeders are allowed to breed and sell hedgehogs without a USDA License if the Breeder has 3 or fewer breeding females. More than 3 females requires a license. Are they a part of the hedgehog breeding community? Ask them if the participate in any forums, or are a part of any groups like the Hedgehog Breeders Alliance, Hedgehog Welfare Society, or the International Hedgehog Association. Do you take good care of your hedgehogs? Ask them what they feed their hogs, what kind of cage they use, what stimulation they provide, how often they're cleaned, and how often they are bred. Females should never be bred more than 3 times a year. Are there any health guarantees and replacements offered for genetic illnesses? A good breeder will offer a lifetime replacement guarantee for WHS and at least a 6 month genetic guarantee. Look for a transparent facility that lists all of their breeding animals and practices on their website. Anything else has the right to be viewed as suspicious. In some respects, choosing a hoglet is like choosing a kitten: the more outgoing ones will be seen crawling about, unrolling playfully and behaving in an extrovert fashion; the quiet, shy and cuddly ones are also exhibiting their traits.Choose the personality that suits your needs and wants. Hedgehogs live 3 - 9 years. Hedgehog age can affect bonding with you but is not as pronounced as with some animals. It is not reccomended for any first time or otherwise inexperienced owner to take in hedgehogs from previous owners. They take much longer to accept the new owner, typically don't bond to you, and 9 times out of 10 come with behavioral problems due to poor socialization. Not that rescued hedgehogs can't be great pets, but it takes knowledge and dedication! Hedgehogs are solitary beings, preferring not to have a cage-mate. Females tolerate another female better than two males or a mix, but still will fight if you have a small enough cage. Watch out for that. However, if you wish to own more than one hedgehog, it is advisable to keep them separately. Ask for proof of veterinarian checks; don't take the seller's word for it. Even if you don't need to ask about vet checks, it may be useful to ask about a vet who cares for hedgehogs, for future purposes.